A thread this week about emoji in Twitter titles provided me an instant treasure trove of design exclusion lessons — broadening my perspective and building empathy for non-visual people using Twitter. First, though, let me back up a step to explain why it’s a gem. Why it illustrates the need for first thinking about exclusion when approaching inclusion. Inclusive design became a major learning trend for me in 2017 — starting with fresh perspectives arriving in my life via the designers and developers at Automattic, especially our Head of Design John Maeda. In April I jumped straight in via the Design and Exclusion conference we launched in collaboration with Twitter, NextDoor, Airbnb. Listening to debiasing stories where people shared intimate details of feeling excluded rocked my boat a bit. My mind really cracked open in August when I become aware of Kat Holmes and her work on this crucial topic. Previously with Microsoft and now via her own company, Kata, Kat presented the foundations of inclusive design internally at work over a video call. She then presented a longer, in-person version at our Grand Meetup in September; and later in 2017 Kat became an official advisor to Automattic, also. Hurray to that! Photo showing the Design.blog page on inclusive design. For a great introduction to Kat and her work, see Kat Holmes: Who Gets To Play? on design.blog. OK, back to the Twitter emoji in titles thing. The author, a blind person named Sassy Outwater, not only points to something incredibly real and timely — but then proceeds to share a master class in accessibility in the reply threads that follow. Here are a few highlights; check out the full thread for more as they come in. Most of the time OCR can be used to flip text rightside up and recognize, not always.. depends on API and context. If text is on an image, much more complicated. That’s why Memes and Gifs are hard. Captions for vids and pics, gifs and memes. Make sure you have good text and background contrast. And no flash or auto-play. Those are the big ones. Most blind or low vision screen readers use Voiceover, Talkbacks Jaws, NVDA or a couple other smaller ones. Web Aim does a good screen reader survey about this every year and publishes their data. Here’s the survey she mentioned: Survey of Preferences of Screen Readers Users on WebAIM. That iPad you are tweeting from has a screen reader. Built in. 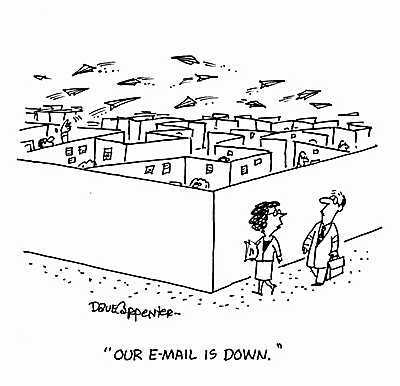 Universal access. Not about shaming or guilting, just about including others and pointing out what people may not have known. Learning. Eye-Mind-opening, thank you Sassy — and Kat, John, Ashleigh, Lori, Anne, Cate, Maria, Davide, DK — and many others who’ve taught me so much about this topic. I mentioned that this is timely — one reason is for learning and improving. The other is sharing what I’ve learned: if you’re in Arizona come to my talk about inclusive design at WordCamp Phoenix 2018 in February. I gave a ten-minute talk on this topic for the Tucson Digital Arts Community WordPress Workshop on January 14th, 2009. The talk could have been titled “How to Build a Private Twitter for Your Group With a Custom WordPress Theme” since that is the main idea. This is the text of my talk. I want to share with you an example of a non-traditional use for WordPress. As I’m sure you may know, WordPress is the most popular blogging software on the market. It is easy to use and customize, makes web publishing simple—it gets the job done. What you might not know, however, is that it does more than just blogs and simple CMSs. I’d like to share one specific example of how I use WordPress to collaborate with a remote team. 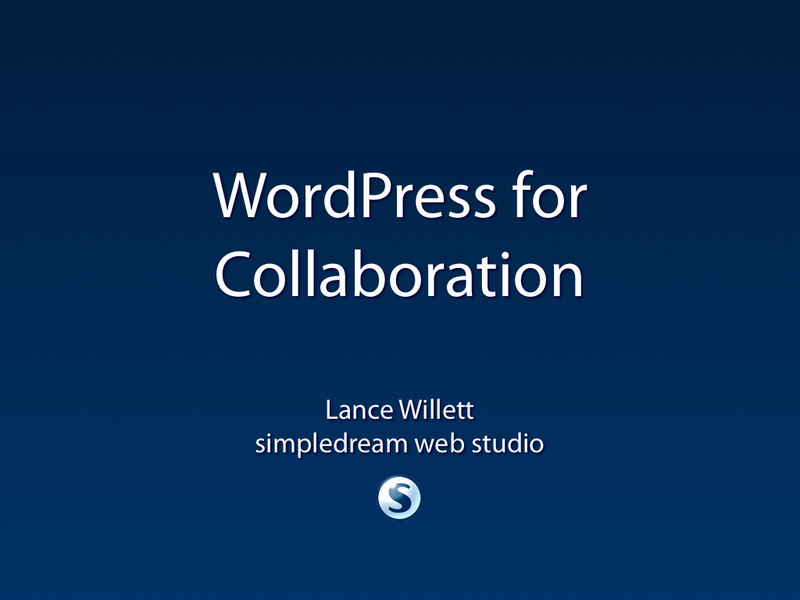 I figure I can kill two birds with one stone: I am going to show you how to use a WordPress custom theme for collaboration in a work environment, and at the same time I hope to encourage you to explore alternative uses of WordPress. I live in an RV and travel around the country, so most of the time when I’m working with my colleagues, I am working remotely. That means that how I collaborate with a dispersed group of people is extremely important since we don’t have lots of face to face time. Even if you aren’t a stay-at-home or remote worker, you still have to collaborate, right? Even if it means sending an instant message to the guy in the cubicle five feet away from you. Who’s done that before? I think we all have. My point is that even if you are in a traditional office environment, it doesn’t mean that all your interactions happen face to face. We all know that good communication is the key to getting things done. And I think my example tonight applies to in-house web design and development teams just as much as it does to freelancers or remote workers like myself that typically use email, instant messaging, and project management software to collaborate; those technologies take the place of the face-to-face interaction. How do you normally share that type of information with your group? And how do you keep tabs on your coworkers’ updates as well? Typically that would be done via email, phone calls, short meetings in the hallway, putting colored cups on top of your cubicle (hey—don’t laugh at that one, it works really well in some situations). When these traditional methods don’t work, or if they aren’t practical, we often look to other tools for sending out quick and simple updates. Updates that are sent without much preparation or the need to open software. Updates that are asynchronous—meaning other people don’t have to respond right away—the message will be there for them when they are ready to read it. Lately it seems like there are more and more products being created to handle this type of communication. One great example is Twitter. It’s awesome, right? You get 140 characters to describe what you’re doing or how you’re feeling, or to post a link. Twitter is extremely popular because it gives you that “chatroom” feel of constant conversation. It’s quick and easy to post but can be engaging and effective. It can be a really great way to simulate being in the same room with someone. 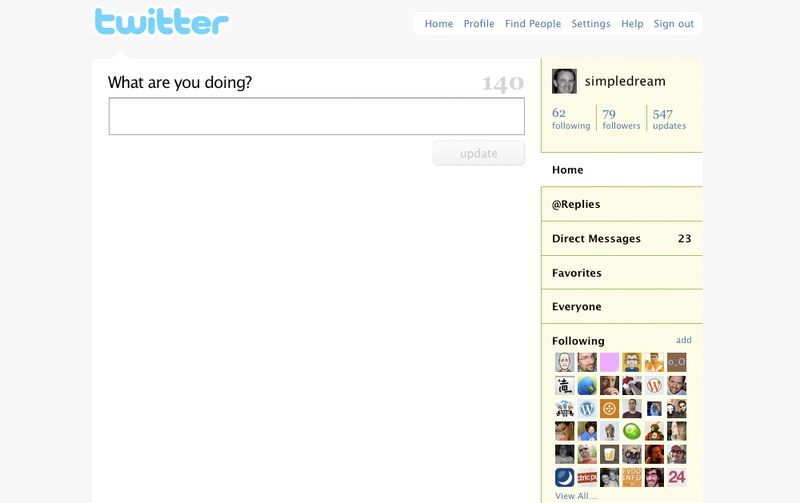 Twitter users share their personal updates with each other by answering the question, “What are you doing right now?” That question is typically a label on the text entry field on the Twitter website, for example. It’s the same action as updating your Facebook status to say you are having a bad day, or what you movie you are going to see that night. You just want to share a quick update without writing an epic saga or opening up your blog software to write a new post. Twitter has changed how people interact. It’s effective precisely because it’s so simple. No tags or categories, no spellcheck, no formatting, just post it and it’s out there for all the world to see. But what if you just need to communicate with one small group of people? About a year ago, right here in Arizona, the makers of WordPress (Automattic) were having their yearly company gathering just north of here, in Oracle. They were thinking this same thing, and there they came up with a theme called Prologue that replicates Twitter-like interactions within a WordPress website. Just like Twitter, Facebook, and other social web apps promote lifestreaming, Prologue promotes workstreaming for your team. Workstreaming is the publishing of work-related activities and events to your remote colleagues. Some might say that it’s also a way to convince your boss that you’re actually working! My work as a consultant sometimes means being part of a small team—for one team I work with often Prologue has become one of our most-used communication tools. Besides constant updates on what we’re doing, we use Prologue as a scrum tool: every morning we all post our daily goals and roadblocks. We also use it for sharing links and tips. But the main purpose for using Prologue is to update each other on our status. How does Prologue help you collaborate better? Prologue is successful because it requires almost no work to post an update. The easier you make it for your team to post, the more they will use it. It allows a quick post on the home page—there is no need to view the admin site. It allows comments so you can create a conversation around what you posted. You can add tags and categories just like normal blog posts in WordPress, but you don’t have to. Like Twitter, you can just type and post. Prologue is free, and easy to set up and use. All you have to do is download and install the theme, then enable it. It’s that easy. Even easier, you can sign up for a free WordPress.com account—it’s a default theme there, so you don’t even have to download it. Here’s how easy it is to start using Prologue with a free WordPress.com account. After you’ve signed up for a free WordPress.com blog, log in and enable the theme. Then go to the blog home page, and post an update. Invite other users to join by adding them to the account. Based on the default WordPress privacy settings, your Prologue setup can be public, or password-protected (meaning available only to your group). The password-protection is available with WordPress.com by default—if you are running your own WordPress site, then you’ll need to implement password protection on your own. 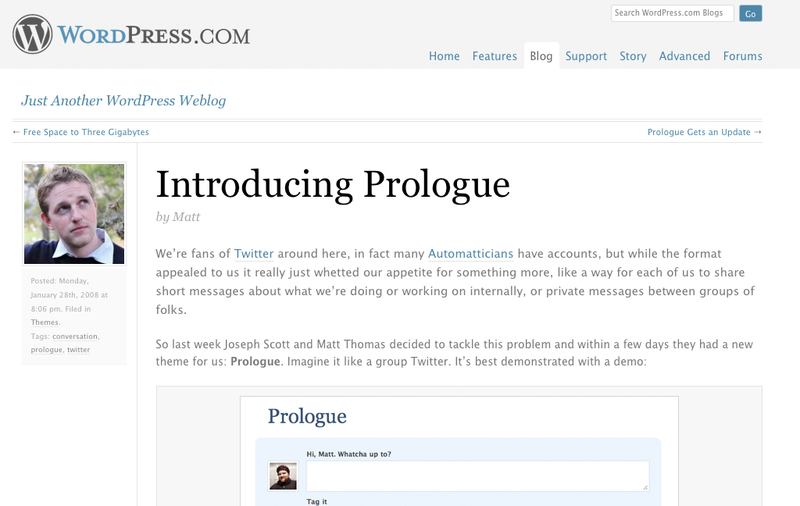 View the Automattic team’s live Prologue demo, and I’d encourage giving it a test run on your own WordPress site.